“The US and Maghreb countries have to work closely together to exchange information to prevent attacks and criminals from preying on our people. Therefore, associations and friendships between our countries are exceptionally important,” said visiting FBI director in an exclusive interview with Groupe Maroc Soir. You have met with several Moroccan officials and you have been received by HM King Mohammed VI. What was your message to the Moroccan officials and what are the conclusions of your talks? I came to discuss international cooperation in the fight against terrorism. My message is to say that no country or agency in the world can be successful without cooperation. Countries have to work closely together in an era of globalization and technology to exchange information to prevent attacks and criminals from preying on our people. Therefore associations and friendships between our countries are exceptionally important. I have discussed with King Mohammed VI the fact that the War on Terror addresses certainly those few individuals who would undertake terrorist attacks. But this also means that we have to work with the social structure, developing the jobs and opportunities that King Mohammed VI has in his vision over the last several years. My discussion indicated how it is important to congratulate him on addressing these issues. I have also met my Moroccan security counterpart and discussed ways in which we continue to cooperate together in the area of exchanging expertise on fingerprints, fingerprint databases, on giving assistance and developing a DNA database structure so that in the future we can exchange these forensic tools and be able to address those threats that we see now and in the future. You have announced for the first time to the Moroccan press that you have a legal representation in Morocco. Yes, our legal attaché in Morocco is Lauren Anderson. She is an exceptionally experienced FBI agent, has been our legal attaché in Paris for a couple of years, and a longtime FBI agent in Washington DC. The purpose of her role in Morocco is to liaise with our counterparts' services in exchanging information, training opportunities, forensics expertise, and assisting on international investigations. Her investigative efforts here are done in conjunction with the counterpart services. We have no independent investigative capability. For example a recent case where we worked corporately was the “Mytob” and “Zotob” computer viruses, the effect of which was seen in the US; the investigations led us to Morocco and Turkey and to arrests in both these countries. This is the type of international investigative efforts that requires us to work closely together. Recently, there have been a couple of visits by high-ranking US officials, including Congressman Lantos and others, your current visit and the coming visit of US Defense Secretary Donald Rumsfield. Does this indicate that the US is willing to play a more active role in finding a final solution to the Sahara issue? I believe that everyone is interested in resolving this three-decade issue and helping the parties to do so. My primary purpose is to continue to build on the very strong foundation we currently have of trust and friendship between ourselves and our Moroccan counterparts. Morocco, along with other countries in the region, has called the UN's attention to the danger of some suspected armed groups operating on the borders between Morocco, Mauritania and Algeria. Does your agency have any evidences that these groups had links with al-Qaida? Well, there have been reports of this and it is important that we and the countries of the region work together to eliminate these threats. You are paying a visit for the second time to the Maghreb region and you have decided to start with Morocco. Does it have any specific significance? Well, Morocco has been a good friend to the US. We have exchanged information and intelligence since I have been an FBI director. I know that Morocco, Algeria, Tunisia and Libya are working together to address terrorism. So, we have to continue building friendships and the mechanism for exchanging information quickly that will help us together to prevent future terrorist attacks. International and Moroccan media reported that the US is illegally transferring prisoners from Guantanamo to other countries, including Morocco, to be tortured. To what extent this is true? I will go back to what Condoleezza Rice said the United States conforms to the international law and respects the sovereignty of the any of the countries with which it deals. You have a long experience in the fight against terrorism, public corruption, organized crime, financial fraud, narcotics conspiracies, and international money launderers. It has been known that terrorists all over the world use the same techniques and technology and “know-how” to implement their strategies. How do you deal with that? Have you adapted a different strategy to crack down on these terrorists? Ten to twenty years ago, if you are a police officer and you look at domestic challenges within the country and the very rare cases that take you outside the country. If you are a CIA official or from another intelligent agency, you will be looking outside and the information will be gathered abroad and then looked at back home. But because of globalization, information today has to flow from the domestic to the external agency. For us to be successful in the US, we have to break down the walls between our intelligent services and others and exchange data to prevent attacks. International terrorists make money from narcotics traffic, fraud, smuggling. So it is very difficult to differentiate now between what is criminal and what is international terrorism. We also have to be wary of domestic terrorism. In the fight against terrorism or any organized crime, bodies like the FBI are usually investigating on a specific criminal or terrorist or enemy. However, in the so-called war on terrorism, there is no physical enemy. How can you conduct your investigation in this regard without facing a specific target? Don't you think that there is a risk of generalization and state power abuse? I think that you have to weigh effective intelligence gathering against assuring the civil liberty of your people. And with technology changing so swiftly, it is important that the intelligence community have the tools to be effective while keeping in mind the US constitution. We have to know that it is people who commit terrorist acts not machines. So we have to identify the group of people who intend to commit terrorist attacks, but without neglecting the context in which they operate. Several people in the Arab and the Muslim World generally feel humiliated and disgusted over the US foreign policies in the Middle East. Do you think that any change in these policies will alleviate the burden on your agency in terms of investigations, because people who feel humiliated may resort to violence or terrorism as a protest against these policies? There might be a number of reasons why certain people may feel this way, but I do not tend to generalize. You are generalizing and I hope you don't feel humiliated talking to me. Of course not. We are just giving you a wide picture of how people in the Middle East feel about US policies, and you can read that in the press. Widely spread? Where? I read the Moroccan press in Morocco, and I don't feel it is the case. Maybe in the Middle East? Well, what's the Middle East? You see you are generalizing. I think countries which harbor and support terrorism should be dealt with harshly. When you talk about countries such as Morocco and you walk down its streets today, I would think people would be happy to see us. So I reject generalizations. There are polls conducted there and it really depends on one's experience. I would like to see Moroccans and Americans exchange visits or to study, and understand what the people like. So, I oppose generalization and the perception that the US is humiliating others around the world. I just don't think it is accurate. Those of you who have been to the US know that it is not the case. Bush has recently admitted spying on Americans in the name of protecting the homeland security. We would like to know if the FBI was involved in this affair. Do you think that spying on Americans is necessary to protect them from any terrorist threat? I am not going to go into details of that. But I will say that your characterization is not the appropriate one. There is an entity to intercept conversations of those associate with al-Qaida inside and outside the US, knowing that we are at war with al-Qaida. 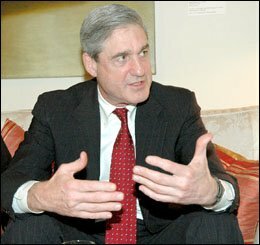 You are a New Yorker before being an FBI head, and since you were appointed just one week before the tragic 9/11 attacks, could you tell us how you lived the event both at the professional and the personal level? I think everybody in the US was very much affected by September 11. You are losing 3,000 of your citizens. I worked on the Lockerby (PanAm 103) case some time ago, and I spent a great deal of time with the families of those who had lost their loved ones. That had a huge impact on me. And when you work on a case such as this and you see what happened on 9/11, you want to do every possible thing to prevent Americans such an attack.